These little pots of deliciousness tick so many of my favorite dessert boxes. Brown butter? Check. 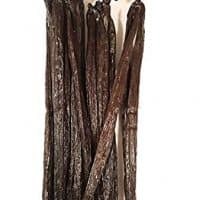 Vanilla bean? Check. Caramel? Check. Salt? Check. And an optional splash of booze? Check. They are rich and smooth and creamy with a real depth of flavor from all the browning and infusing and caramelizing. They are the result of an idea that’s been rolling around in my mind since I read about something similar on Molly’s site just, oh, six years ago. I always figured I would get around to making them eventually. And when we were having our good friends Maria and Tracy over for a low key dinner the other Friday, it seemed like just the thing to cap off the meal. 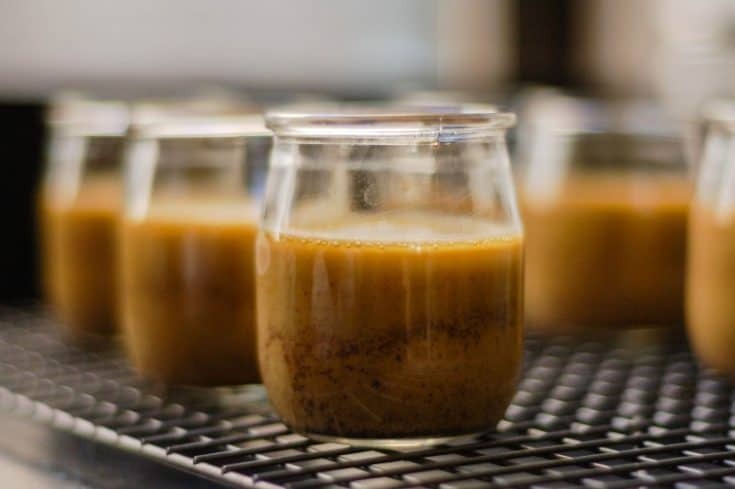 Except, when I went back and looked at the recipe, I realized it had shifted and changed in my memory, and while I have little doubt that those butterscotch pots de creme are wonderful in their own right, they just weren’t what I was craving. I wanted something that didn’t just use a combination of sugars, but something that included the alchemical wonder that is butter browned with a vanilla bean. And I wanted a salty edge to the thing. I couldn’t find a recipe that was quite what I was looking for. This came close. But I hadn’t yet hit the bullseye. So I took matters into my own hands. I browned butter with a half a vanilla bean and whisked it into some cream that had been heated with deep dark molasses-y muscovado sugar. I caramelized some light brown sugar and then added the brown butter-cream mixture to that. I added a splash of dark rum for another cane sugar note, and then I whisked it all with some egg yolks. Then I tossed in some salt. And when these came out of the oven, they were just what I wanted. 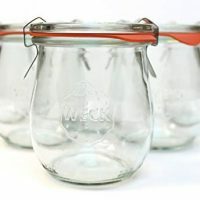 They had all of us scraping the bottoms of the jars to get every last bit. They’re luxuriously rich but modestly sized desserts. Tracy said they’re the kind of thing that leaves you wanting more. They were nice with a dollop of whipped cream and some rosemary pine nut cookies on the side. To be honest, they were also pretty darn good the next day, completely unadorned. 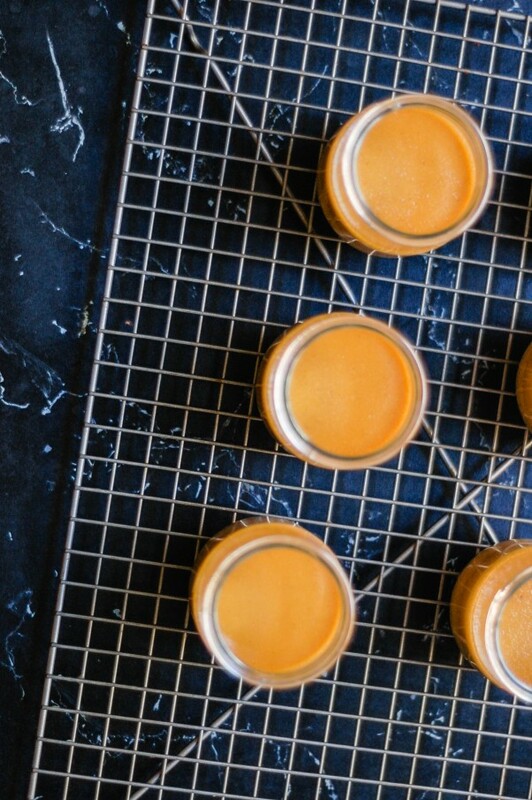 Looking for more rich caramel desserts baked in tiny jars? 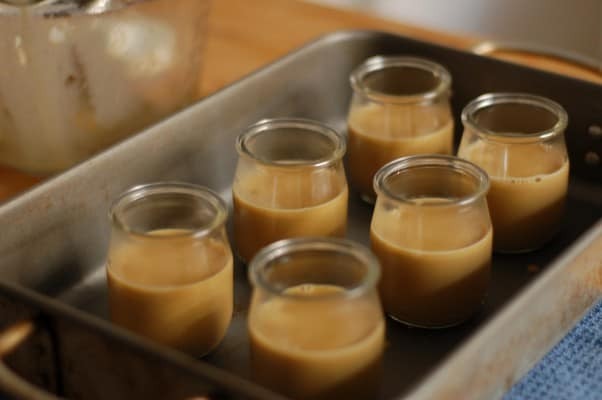 Try these passion fruit caramel pots de creme. Browning butter with a vanilla bean is a trick I learned from Kate Zuckerman’s The Sweet Life, and it’s a technique I use all the time for making simple desserts extra special. You could certainly make these without the vanilla bean and add a splash of vanilla extract along with the rum, but this is one of those places where a vanilla bean really makes a difference. You could absolutely use dark brown sugar in place of the muscovado. The muscovado has a more complex flavor, but you’ll get the important dark molasses notes with the dark brown sugar as well. These are nice topped with whipped cream and some crisp cookies on the side, but they’re very nice on their own too. 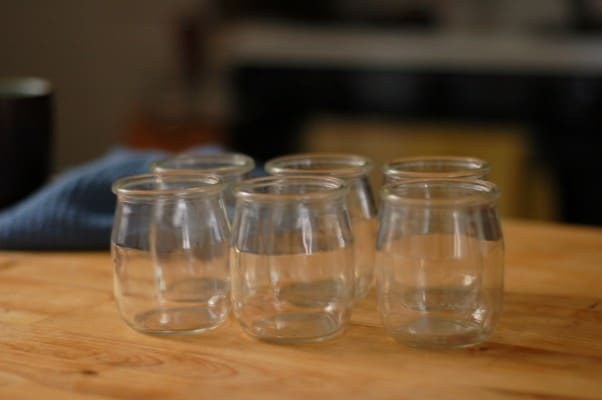 Preheat oven to 325° F. Have six 6-ounce ramekins or jars and a large roasting pan ready. 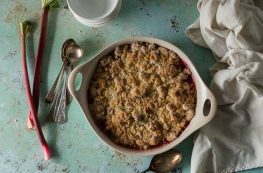 In a small light-colored saucepan add the butter and vanilla bean. Heat over medium-high heat until the milk solids turn the color of almond or hazelnut skins. The butter will sputter and foam and then settle down as the water evaporates so you can see the milk solids. When they are browned and fragrant, remove from heat. 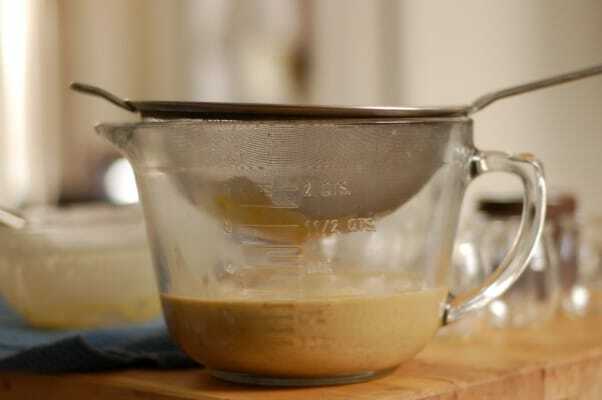 In a medium saucepan, add the cream, muscovado (or dark brown) sugar and vanilla bean brown butter mixture. Bring just to a simmer and stir until the sugar has dissolved. Remove from heat. In a small saucepan, add the light brown sugar. Add enough water to the saucepan to cover the sugar (about 1/4 to a 1/3 cup of water should do it). Bring water and sugar to a boil, and cook over medium heat until the sugar is bubbly and dark brown, about 5 minutes. 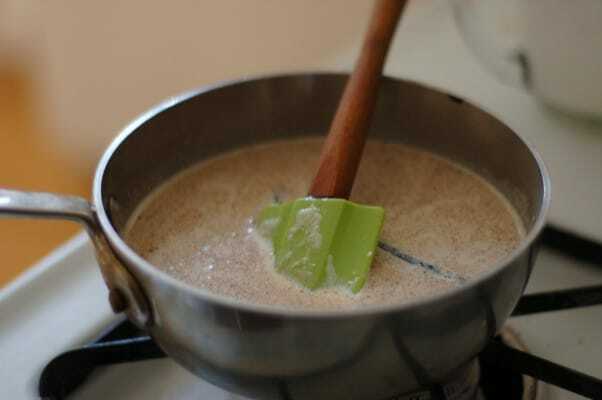 Remove from heat and whisk in the warm cream mixture until combined. Add the salt. 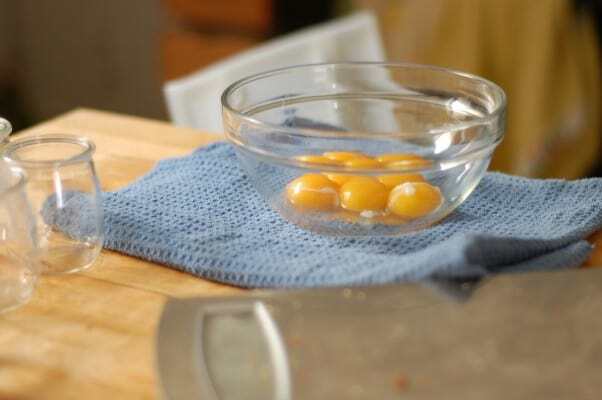 In a large bowl, whisk the egg yolks and rum (if using) until combined. 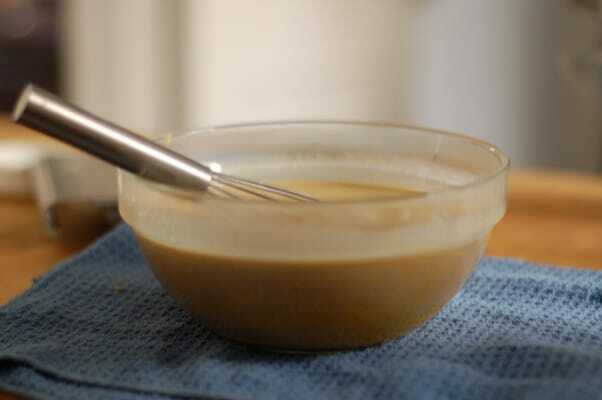 Pour in the caramel cream mixture and whisk until combined. Pour through a fine mesh strainer into a large (at least 4 cup) liquid measuring cup or bowl with a spout. Divide the mixture between the six ramekins or jars. Place the jars in the roasting pan and add enough hot water (hot from the tap is fine) to come half way up the jars. Cover the pan with foil, carefully transfer the whole thing into the oven, and bake for about 45 minutes, or until the custard is set around the edges but still trembles in the middle. Keeps for up to two days in the refrigerator. These look AMAZING. I LOVE LOVE LOVE pots de creme so I’m pretty sure I’ll be making these this weekend. Scrolling through I also saw your recipe for Passion Fruit Caramel Pots de Creme, which I’m very excited about. Thanks for sharing! Can’t wait to try both of versions. Thanks, Gabi! I love both versions. This one is dark and rich and buttery with caramelized flavors. The passion fruit caramel has a tropical brightness balanced with the caramel. Let me know how they turn out! YUM! These looks so good and I LOVE the little glasses. Thanks for sharing! Thanks! I love the little glasses too! They’re yogurt jars from a local dairy (Trader’s Point Creamery) that I saved. I love using them for individual desserts. Something new I will have to try. Thanks, Candy! I hope you do try it. Yum! This looks so delicious and perfect for the fall season. That looks delicious. I’ve never had any kind of Pots de Creme. Thanks, Angie! If you like rich creamy puddings, custards, or mousses, you’ll love pots de creme (which is really just a fancy French way of saying pots of cream or baked custard). So much YUMMM!!! Where did you get the containers? Thanks, Meredith! The containers were yogurt containers that I saved from Traders Point Creamery (http://www.traderspointcreamery.com/). These look delicious! And I love the little pots you are making and serving them in! So much cuter than a traditional ramekin! Thanks, Natasha! I’m a sucker for cute jars. I’m feeling the burning desire for making and eating these!! This is making me hungry! It sounds divine! These look heavenly. I love the presentation in these cute glasses. 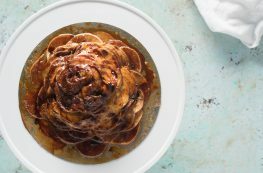 I’m not a dessert girl, but this looks amazing! Thanks, Tamara! I find these hard to resist.